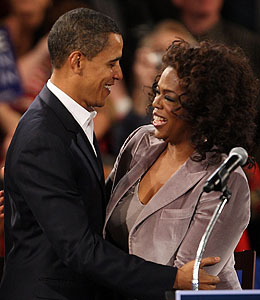 Despite stumping for Barack Obama since the early days of his presidential campaign, Oprah Winfrey says that she never considered working for the President-elect in office. "I have a few full-time jobs already and a few full-time commitments, you know -- contractual commitments that say I have to be where I am," Lady O revealed to AP. "So, it never ever occurred to me." Winfrey continued on to say that even if Barack extended a position to the talk show queen, she would turn it down due to her other contractual obligations. "Even if I was offered, I still have contractual commitments and what could I do?" Oprah said. "I do what I do best on TV every day." The media mogul is set to attend Obama's inauguration on January 20 -- and admits that despite reports that have suggested otherwise, she is still dress shopping for the occasion. "I actually haven't picked it -- I had a dress on the vision board, but I'm not sure that's gonna fit, so I have to work on something else."